The BMAs are an initiative to bring together and recognise the achievements of musicians and industry professionals across the Midlands. Birmingham is steeped in rich musical heritage, bursting with talent, education institutions and some of the best live music venues in the world. These awards are building a Birmingham music community that supports local musicians, provides music infrastructure and enables on-going Birmingham music success by rewarding the achievements of all those responsible for this city’s music landscape. 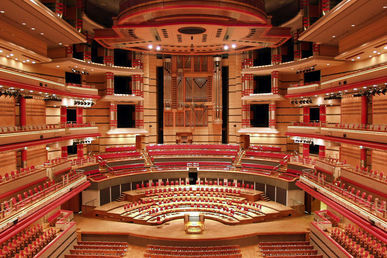 Town Hall and Symphony Hall have been nominated for the Best Venue (Over 500). Each year, we programme nearly 800 concerts and events and bring the best jazz, folk, world, roots, classical, rock and pop performers to audiences of over 550,000. Generation Ladywood is Town Hall Symphony Hall's long-term project to provide musical opportunities in an area where 53% of children live in poverty (source: End Child Poverty Coalition, January 2018). Project Soundlounge enables a group of young people to program, produce and market their very own music festival. Whilst a member of the project, young people gain valuable experience working in the arts, and develop skills in artistic programming, digital media and communication.